The plain difference between graphics that seem to be identical. I occasionally receive e-mails asking what the difference is between the "official" artwork posted on www.rotary.org and the artwork available in this Library. To the untrained eye the difference may seem neglectable. But for every trained professional graphic designer the flaws are obvious. Especially in the quality of the vectorized eps logos, required for sign making or other processes that demand outlined artwork, including high grade print work. Compare the two below and observe the differences. The official artwork contains endless and numerous overlays, and lines not defined as areas. Therefore colors, lines and fields will be overprinted instead of interpreted as separate artwork components. It is my hope that my contribution and effort will add to the the quality of any work presented and performed by Rotary Clubs and Rotarians. © Tord Elfwendahl. All and any use of the contents of this library for commercial or similar purposes, or fee based venues, without prior written permission from the copyright owner, may be subjected to legal action on the grounds of intended Copyright Infringement. 1. 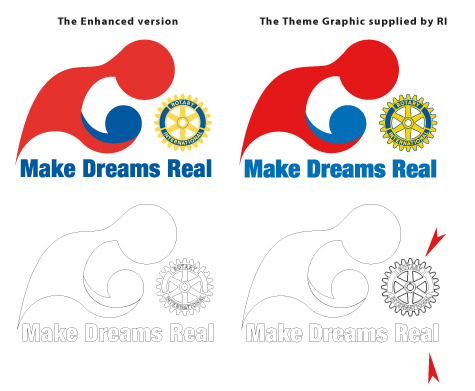 The Rotary Wheel should not be outlined, thisaccording to RI own trade mark regulations. 2. The use of two different shades of Blue weaken the logo. Blue is one of the RI logos colors. Use it!